A native of Columbia, Kentucky, Russell Miller Barnes graduated from Russell Springs High School. In 1950, he received a Bachelor of Science degree in electrical engineering from the University of Kentucky. While at UK he was a member of Tau Beta Pi engineering honor society; Eta Kappa Nu electrical engineering honor society; Sigma Pi Sigma physics honor society; and Triangle Fraternity. After graduation, he joined the Philco Corporation in Philadelphia as a field engineer. In this first position, he was assigned to the installation and evaluation of Early Warning Radar Sites throughout the northwest United States. In 1954, Mr. Barnes joined National Scientific Laboratories, Washington, D.C., as a project manager. In what was to be the beginning of a distinguished career in the aerospace industry, Mr. Barnes joined Pan American World Airways, Patrick Air Force Base, Florida in 1955 as an electronics engineering specialist. By 1957, he was named manager of technical planning and in 1960 was named manager of range development. In 1963, Mr. Barnes was awarded an Alfred P. Sloan Fellowship from the Massachusetts Institute of Technology (MIT). After receiving a Master of Science degree in Industrial Management from MIT in 1964, he returned to Pan American and was appointed manager of operations. As such, he managed all field forces for the company totaling over 4,000 employees. In March 1969, he was named general manager, Aerospace Services Division, and was responsible for all Pan American activities at the Cape and Test Range Tracking Stations. Mr. Barnes was appointed vice president of Pan American’s Aerospace Services Division in 1970. In this position, he directed all operations at the Air Force Eastern Test Range, Patrick Air Force Base, Florida; the Churchill Research Range, Ft. Churchill, Canada; Johnson Space Center, Houston, Texas; Kennedy Space Center, Florida; and the Safeguard Support Services Project, Langdon, North Dakota. In July 1984, Mr. Barnes was promoted to senior vice president and chief operating officer of Pan American directing six operating divisions: aerospace, base support, engineering, maintenance, general aviation and international engineering. In December 1985, Mr. Barnes was named president of Pan American World Services. By 1988, as a support system for research and development testing, Pan American World Services had tracked and monitored more than 2,500 launches of guided missiles at test ranges across the country. It also operated engineering and support projects for NASA, including maintenance for the Space Shuttle program. However, its operations were not confined to the United States. Pan American World Services planned and developed the first major international airport in Saudi Arabia as well as developed and managed airports in 15 countries throughout North America, the Middle East, Far East, Africa and Asia. Under his leadership, the company’s profits reached $23 million by 1988. Pan American Airways sold World Services, its most profitable subsidiary, to Johnson Controls in 1990. Mr. Barnes remained as president of the renamed Johnson Controls World Services, Inc. until his retirement in 1992. 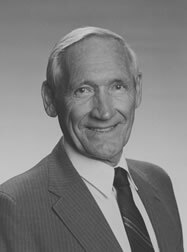 Mr. Barnes was active in numerous professional organizations during his career. These include the Society for the Advancement of Management, American Ordnance Association, Missile, Space and Range Pioneers, National Contract Management Association and the American Society of Military Engineers. He was a founding member of the South Brevard YMCA Board and founding director of the Fidelity Bank of Florida. He serves on the boards of the United Way of Brevard County, National Contract Management Association, Florida Technical Institute, Circle of Care Brevard County and Brevard Community College. He is a director of the First Union Bank of Brevard and First Bankers Corporation and served as general chairman for the Twenty-first Space Congress, Cocoa Beach, Florida. Throughout his distinguished career, Mr. Barnes has received numerous honors and awards. These include the Apollo 11 Manned Lunar Landing Mission Certificate of Participation, Apollo Achievement Award, and the Public Service Achievement Award. In September 2001, Mr. Barnes received the National Space Club’s Lifetime Achievement Award for his long-term contributions to our nation’s space program. He is an Associate Fellow of the American Institute of Aeronautics and Astronautics and was listed in Who’s Who in Finance and Industry, 1983 and Who’s Who in the South and Southwest, 1976 – 1979. Mr. Barnes and his wife, the former Margaret Harding, reside in Melbourne, Florida. They have two children, Lisa and Randall.